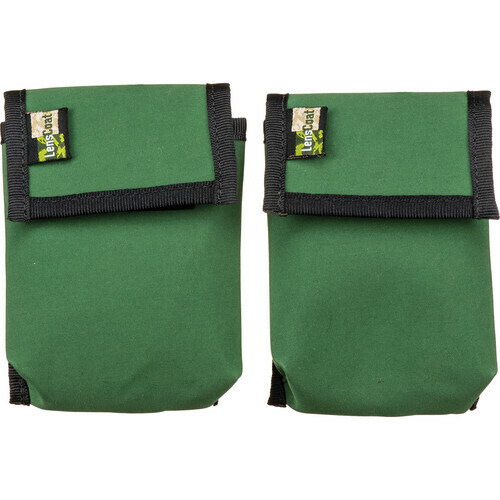 The green BatteryPouch Pro DSLR 1+1 from LensCoat consists of two pouches that each hold one lithium-ion battery. Both pouches snap together to hold the batteries for easy storage and retrieval. Each pouch seals with a touch fastener. When not utilized, they fold flat for storage within your gear bag or luggage. A belt loop gives you quick access to the batteries and eliminates having to search through your shoulder bag or backpack. The pouches are made from a waterproof poly twill and nylon material. This cover is a solid green that blends in well with surrounding foliage. Box Dimensions (LxWxH) 10.0 x 8.5 x 2.4"
BatteryPouch Pro DSLR 1+1 (2-Pack, Green) is rated 4.6 out of 5 by 11. Rated 5 out of 5 by Christopher S. from FIT THE NIKON EN-EL 18 BATTERY PERFECTLY When I ordered these I wasn't sure if they would fit the Nikon EN-EL18 battery. They fit perfectly, even with the battery cover door attached. A nice way to carry and protect your extra batteries. Rated 5 out of 5 by Bird Photographer from Keeps my expensive batteries protected! The battery pouch Pro DSLR 1+1 is a great product and always keeps my batteries safe and protected. Easy to carry in the field , I always have a spare battery at hand. Better than keeping in my pocket when travelling with my big rig. Great idea and something I was looking for ,for a longtime! Rated 5 out of 5 by Russ from Excellent Product I purchased this for my Canon EOS 1DX batteries. These batteries are quite large but this case holds two (2) batteries perfectly. Excellent purchase. Rated 4 out of 5 by Kent S. from Nice Battery Pouch As with most LensCoat products this battery pouch is well made. It is actually two battery pouches snapped back to back. They can be separated and the nylon snap strap can be used as a belt loop, or attachment point for a camera bag strap. The closure is Velcro and seems reasonably secure. A Nikon EN-EL18a fit comfortably in the pouch. The pouch can hold two EN-EL15 batteries. The pouch provides a nice means to carry several batteries while providing a bit of protection. Rated 4 out of 5 by Warren J. from LensCoat Pro DSLR Battery Pouch Nice pouch in Green color so that I know it has batteries in it for the D4s camera. My Black Think-tank Pro DSLR battery pouch holds the batteries for my D3s camera so that I know which extra batteries are in which pouch. At this point in time: it's a battery pouch made to hold extra Pro camera batteries. It does what it was designed for. What else is there to say? Rated 5 out of 5 by Cindygrahamphotography from Perfect!! The best way to store, transport and protect your extra batteries. Convenient pack helps with locating the battery also after you've tossed it in that already crowded equipment bag! Great product. Rated 5 out of 5 by John P. from Great idea!! I bought these pouches to hold batteries for a Nikon D3. They not only protect the terminals when being carried in a backpack or camera bag but also when in a pocket or being hooked to a belt. Rated 4 out of 5 by PhotoRick from Very handy for storing batteries. This Nylon pouch carrier holds two batteries securely with a Velcro cover flap. The two pouches can be separated and each has a belt loop that provides options for carrying. Will this pouch hold a 1DX Mark II battery? I use the pouch to hold an LP-E4N battery. Fits like a glove. So the Ad says 1 pouch holds 1 battery. Is there room for 2 batteries (EN-EL14) in one pouch? the reviews are contradictory.